I'm gearing up for end of semester exams - and doing the usual work and writing etc etc - so things are a bit fraught. Meanwhile, the cats are working in their own way. My! Am I glad I bought a treadmill! You can see their secret thoughts by rolling your mouse over the picture. 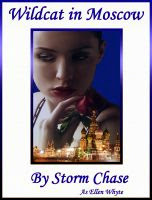 PS, also made a new cover for Wildcat in Moscow, a fast paced romance. Check it out here. Never in my life have I seen such fine, ManCatly musculature! Yep, that's our kinda exercise, too. a better use for it than a clothes hanger! Work it kitties! No wonder you kitties are so tired! A treadmill does that to you. Rest up, muscles are nothing if you're grumpy. That's what we do on the treadmill too! Although the Woman actually walks on it! Can you imagine? That treadmill sure has come in handy! 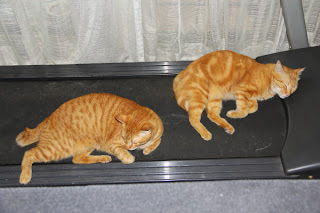 Haha, looks like you are working out really hard :-) I have treadmill (which is not used for a long time) and I encouraged my boys to run on it, but they are totally ignoring it! Guido we think your muscles are very fit after working out on that treadmill! That's the finest use to which we has ever seen a treadmill put! Poor things ! they must be completely burnt out from too much (in)activity ! LOL Guido & Target - you guys sure know how to utilise the treadmill to the fullest!!! All the best in your exams Ellen. And double cat-time Snooze and Nap and Snooze and Nap. I love this. I have a picture of Admiral that I posted in Flickr with her lying in the narrow passage alongside the treadmill and the wall and she was saying how easy treadmilling was! That she wasn't at all winded. Excellent use for a treadmill. The peep doesn't need it anyway. Yes, very fit and mancatly, Target and Guido! What a great investment a treadmill is. YOu look VERY fit, both of you. I LOVED this. real mancats use the treadmill. Guido: I Am A Famous Hunter!